Download our free Near Space Parachute Size Estimator Tool Here! This Space Camp post is intended to give you all the background and tools required to estimate what size parachute is suitable for your HAB mission. 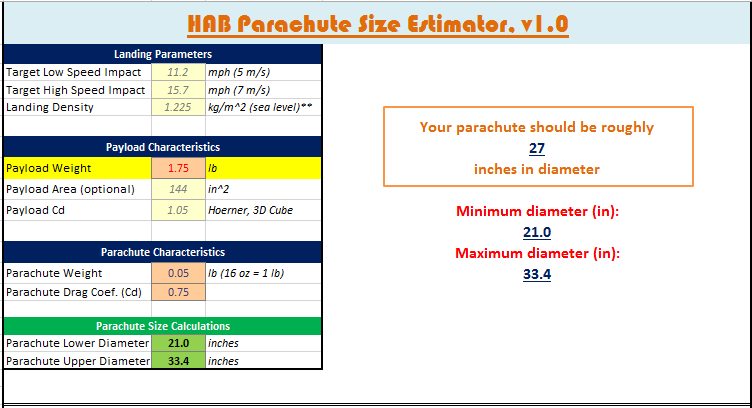 To cut straight to the chase, our HAB Parachute Size Estimator tool is provided here. For background on the assumptions that go into these calculations and to learn more details about the math behind the spreadsheet, please read on! The amateur HAB enthusiast has a lot of questions pulsing through their mind. How big does my parachute need to be? What size balloon do I need, and how high will it go? How do I track my HAB? Stay tuned for the answers to each of these, but we hope to at least address the first question in this post. We created this spreadsheet to assist HAB users in determining what size parachute is required for a successful HAB launch. Key instructions to operating this spreadsheet are provided below, and as always, please submit any and all feedback for improvements and future capabilities to spaceracehab@gmail.com! Voila! The spreadsheet will provide an estimate for the range of parachute sizes you should consider. Adjust your target landing impact speeds in Cell C3 and C4, if desired. Note: between ~11-16 mph is recommended as a good balance between shorter landing time and safe impact speed. The typical parachute you are likely used to seeing have a conical or hemi-spherical shape while inflated. 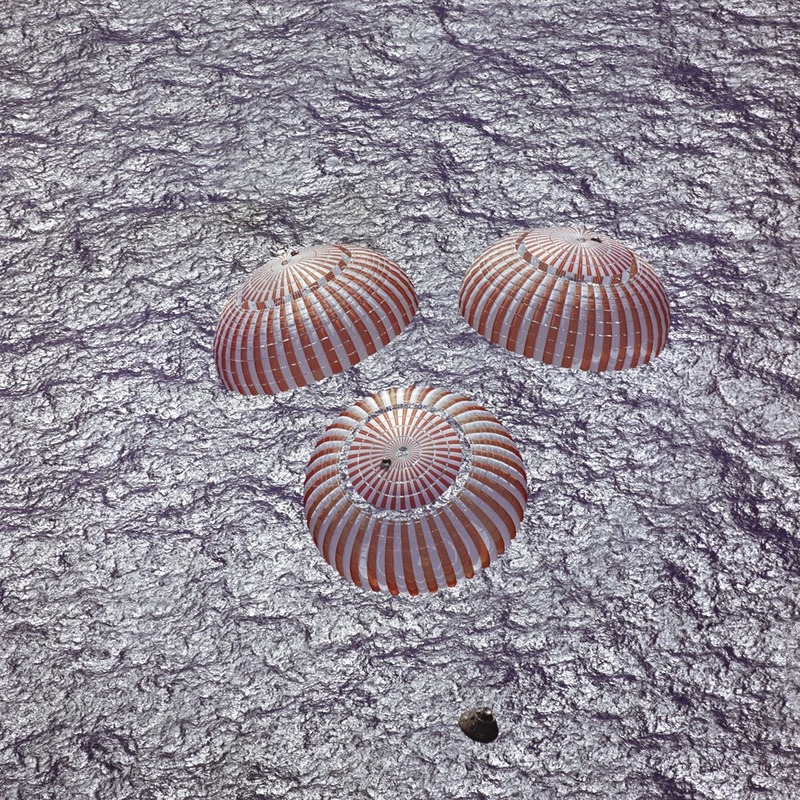 There are many different types of parachutes, with each having its own advantages in certain applications. Below is a short listing of some common (and not so common) types of parachutes, with the major emphasis on the first type (flat circular) for HAB launches. 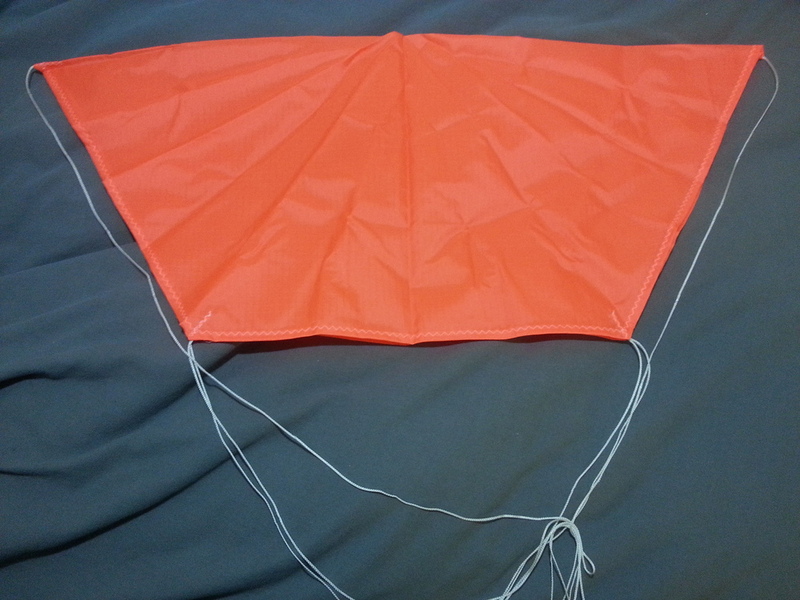 Flat Circular Parachute - these parachutes are extremely common in HAB and hobby rocketry fields due to their ease of manufacture, simple design, and reliability. The trade-off is that the draft coefficient (Cd) is not as high for a given cloth diameter. For the price and for HAB applications, it is hard to go wrong with a flat circular (or flat hexagonal, as we use) parachute. Typical drag coefficients range from 0.75-0.80. 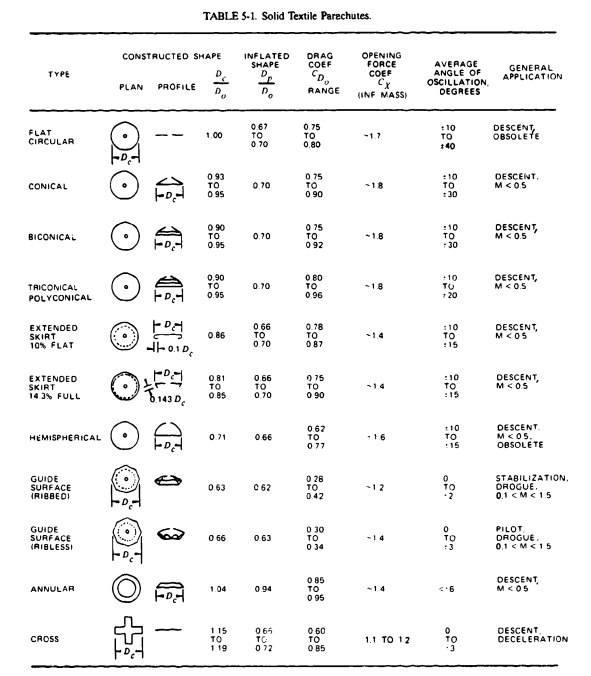 Other Parachutes - a short list of other parachute designs and typical drag coefficient ranges is presented below from Knacke's Parachute Recovery Systems Design Manual (1991). Thus, our spreadsheet provides known values or estimates for all the above variables, and then calculates the resulting radius (and diameter) of the parachute to result in a desired landing speed. Drag and Weight of the parachute and balloon itself on descent are assumed to cancel out. This varies from flight to flight. Also, if your balloon entangles the parachute lines or happens to generate more (or less) drag than predicted, this can affect your descent predictions. We have found through experience that this typically cancels out, but one way to ensure the balloon does not affect descent would be to include some type of cut-down mechanism to sever the balloon after it bursts. Assumes sea-level landing, standard day conditions. If the conditions are extreme (either hot or cold) and the altitude varies significantly from sea level (e.g. at high altitude), this can affect the estimated impact velocity. Assumes no vertical component of wind. Wind can affect descent results.